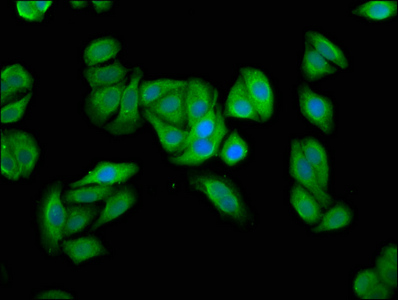 Immunofluorescence staining of HepG2 cells with UBIAD1 Polyclonal Antibody at 1:66, counter-stained with DAPI. The cells were fixed in 4% formaldehyde, permeabilized using 0.2% Triton X-100 and blocked in 10% normal Goat Serum. The cells were then incubated with the antibody overnight at 4°C. The secondary antibody was Alexa Fluor 488-congugated AffiniPure Goat Anti-Rabbit IgG (H+L). K3) and then prenylating it with geranylgeranyl pyrophosphate (GGPP) to form MK-4. Also plays a role in cardiovascular development independently of MK-4 biosynthesis, by acting as a coenzyme Q10 biosyntetic enzyme: coenzyme Q10, also named ubiquinone, plays a important antioxidant role in the cardiovascular system. Mediates biosynthesis of coenzyme Q10 in the Golgi membrane, leading to protect cardiovascular tissues from NOS3/eNOS-dependent oxidative stress. UBIAD1 Polyclonal Antibody. Unconjugated. Raised in: Rabbit.